As far as Laara Exsnar is concerned, educating kids about food in a fun and engaging way is an important factor in family bonding, resulting in healthier and happier kids. To that end, the Vancouver resident with a background in food and nutrition co-authored a series of children’s books with her daughter, Erin Kurt. The books are about two children who go on adventures that always lead them to make or bake “nutrilicious” food—food that’s both nutritious and delicious. 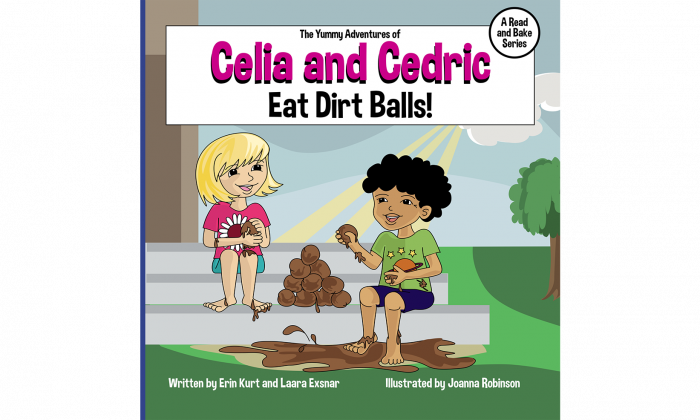 The three-book series, titled “The Yummy Adventures of Celia and Cedric” was launched May 1, with more books to come. A first-of-its-kind children’s “read and bake” series, it combines reading books and sharing meals—two activities Exsnar says are an integral part of building parent-child and grandparent-child connections. “Both of these enjoyable pursuits build happy, lifelong bonds,” she says. Exsnar spent years testing her recipes on children of all ages while teaching community workshops for kids. She also created an online program for parents who struggle with picky eaters. So coming up with tasty recipes for the books was no problem for her. “The recipe is always provided at the end of the story and it is the motivation along with the story to encourage kids to want to make the recipe which the characters just enjoyed,” explains Exsnar. Exsnar and Kurt are planning to create a “Celia and Cedric” app for children to engage with, and hope to one day see a TV show created based on the books. There are bonuses for those who purchase the complete set of books, one of which is “Snappy Snacks,” an e-book of 15 kids’ recipes. The following recipe for banana ice cream comes from the e-book. There are many ways to make and serve this recipe. First, the bananas need to be sliced and frozen. Using re-sealable plastic bags, slice the amount of ripe bananas into the bag, which will lie in one flat layer after it is resealed. Place on a flat pan and freeze for one to two hours or overnight. Then remove as many slices as you want to make individual portions of ice cream. A good idea is to add Fruit Fresh, a fruit protector that keeps fruit from turning brown which can be found in the canning section of any supermarket. Add just a sprinkle to the bananas, gently shake the bag to disperse, and then place the bananas flat in the bag. Add the desired amount of frozen banana slices to a food processor, blender, or Thermomix Kitchen Machine along with 5 ml (1 tsp) of a milk or cream choice for each 125 ml (1/2 cup) of bananas if done in a blender. For a larger amount of bananas, add 5 ml (1 tsp) at a time so the bananas are blendable and make a smooth texture. Do not add too much milk at a time or it will be too soft. Scrape down the sides as needed while blending. Sundaes: Place desired amount of ice cream in a glass bowl/dish and top with Raw Chocolate Sauce (recipe follows), mini-chocolate chips, chopped nuts, berries, or coconut. Parfaits: Layer ice cream with granola, fruits, nuts, or coconut. Mango-Banana Ice Cream: Add some frozen mango chunks while blending bananas to a smooth texture. This is yummy served in an ice cream cone with a few chocolate sprinkles or mini chocolate chips on top. Mix ingredients together in a small mixing bowl with a whisk or fork until all are well blended.